When Mary Ann Mason became the first female graduate dean at U.C. Berkeley in 2000, she noticed a trend. The number of women on the faculty was nowhere close to the number of women in graduate school. This imbalance inspired her to embark on a ten-year-long research study that looked at the effect of childbirth on several professions: STEM academia, law, medicine and business. She found that even though many women have flocked to many of these professions, many more have opted out of them when they started a family. Mason’s research resulted in The Do Babies Matter? Project, which the California legislature ended up using to pass Title IX, a law mandating a strong leave policy with a right-to-return for both mothers and fathers who had babies during their graduate school years. In her new book, Babies of Technology, which she co-authored with Tom Ekman, she explores the legal and cultural landscape of the fertility industry, including egg freezing, which has now become the fastest growing area of the fertility industry. 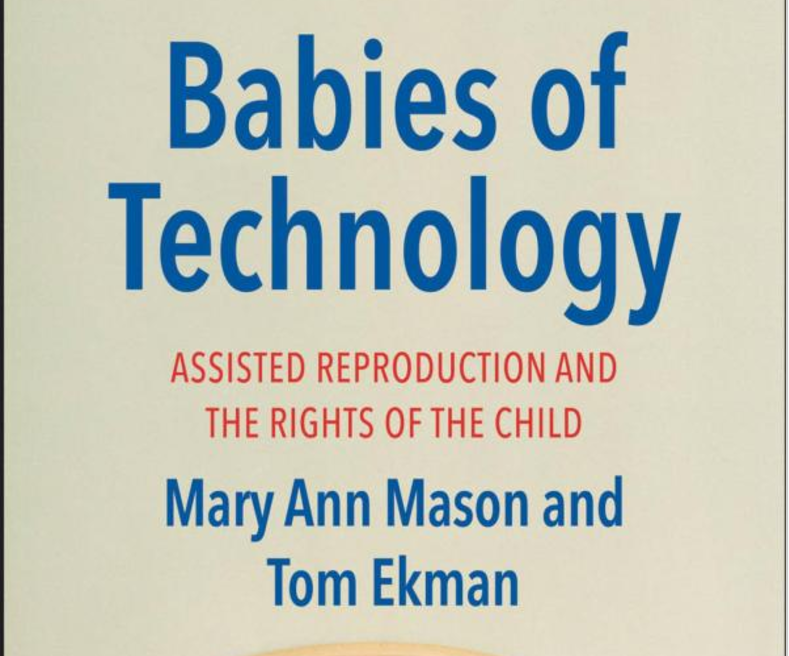 Mason and Ekman ask vital questions about the rights of children born from reproductive technology. This includes babies conceived through fertility tourism, the rights of donor-conceived children, and the impact of genetic testing and near-future reproductive technologies like CRISPR-9 gene editing. In this interview, she offers her position on egg freezing and asks why the US doesn’t yet have an agency that regulates fertility and reproductive technology? RLH: Do you think that egg freezing is a detriment to women’s progress or would you qualify it as an additional choice for women? MC: It’s a way of avoiding the obvious, which is that we really need to have paid childcare and family leave for mothers and fathers. It’s crazy. Companies like Apple and Facebook paying for the cost is something, but it’s not huge. They’re keeping people in the workplace. It’s a very selfish approach, I think. And we don’t really have any champions. Hillary was a better champion. Ivanka Trump has made noises about paid family leave — that’s the essential thing, not freezing your eggs. RLH: You argue that the fertility industry needs better regulation in general? MC: In this country, we almost never talk about the right of children. They do in Europe. In 1989, the UN had a Convention on the Rights of the Child. All the United Nations states came and they all signed and ratified a treaty, which gave 37 specific rights to all children. Some of them had to do with being represented in court or at administrative hearings or not getting tortured, but a lot of them had to do with things like knowing your own biological and cultural identity, which is what you don’t get when you have anonymous egg or sperm donors. America didn’t sign it because we’ve never sign much of anything the UN does, but mainly because we have the abortion wars going on. So we can’t really talk openly about the rights of the children. We have civil rights for race and for gender, but we have nothing for children. RLH: How would you define a child? MC: I’ve been on several interviews now in which I’ve been asked this question. Somehow it never occurred to me this would be a problem, but it has been. I say a child is as the Constitution says in the 14th Amendment, “a person born in the United States.” It’s a person born. I think most women would probably agree with that, but clearly many don’t and the church doesn’t. So we’ve had a very hard time dealing with children’s rights because people end up asking: are embryos children? Are fetuses children? It gets caught up in that horrible mess of contradictions that just doesn’t help children who are actually born to have any rights. RLH: What’s a right you would argue children born from technology need? England has the Human Embryo Fertility Authority. They really keep their eyes open and they do not allow anonymous embryo adoptions or anonymous sperm donors. They’re very careful about what can be experimented on. It really does pay attention to all aspects of the fertility industry. In the US, paternity issues are still very confused, (See Minimally Viable Dad). RLH: What about the American Society for Reproductive Medicine? MC: It’s a professional association, so they have no legal clout. They can make recommendations but that doesn’t doesn’t mean that they are followed. The FDA does get involved with tissue, so when during the HIV epidemic they insisted that all sperm be frozen, tested and then frozen and tested again after six months before it could be sold. But that was more of a health control issue; it wasn’t a “rights of the child” issue. RLH: What steps do you recommend moving forward to protect the rights of children born from reproductive technology? My recommendation in the book is also to have another UN Convention on the Rights of the Child of Technology. The country is changing in so many ways and the impact of reproductive technology is really fundamental because it’s changing the structure of the family and impacting children.